Troy High School senior Finnian Jacobson-Schulte is among the nation’s brightest students and has been named a semifinalist in the 2017 National Merit Scholarship Program. 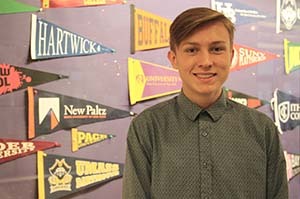 Finnian is among 16,999 semifinalists across the nation representing less than one percent of all high school seniors. He was selected from more than 1.6 million students who entered the competition by taking the 2015 Preliminary SAT/National Merit Scholarship Qualifying Test. If named a finalist in February, he will receive a $2,500 scholarship from the organization. Last spring, Finnian earned the highest possible ACT Composite score of 36. On average, less than one-tenth of one percent of students who take the ACT earns the top score. Finnian is a well-rounded student who participates in extra-curricular activities and is a star athlete on Troy High School’s track and cross country teams.